Equipment usage: Is suitable for the determination of various kinds of unvulcanized natural rubber, synthetic rubber and reclaimed rubber Mooney viscosity, the scorch time and curing index. 2. Control system: adopting computer control and touch screen + PLC control module for data collection, storage, processing and printing test results and curve processing, testing process curve comparison and history curve comparison function. 3. The rotation system: the gear deceleration LI - MING Machinery import control motor + gear reducer, gear. 6. Display mode: TY Viscosity + 7 test software of computer screen and high resolution touch screen man-machine interface. The whole measurement is made very convenient, fast and accurate. 7. The rotor: Cr6wv material, high strength and abrasion resistance. 8. Measurement method: Humanistic way of measurement and control, mouse click the box or touch screen light touch two double way. Looking for ideal Rubber Mooney Viscometer Manufacturer & supplier ? We have a wide selection at great prices to help you get creative. All the Reclaimed Rubber Mooney Viscometer are quality guaranteed. 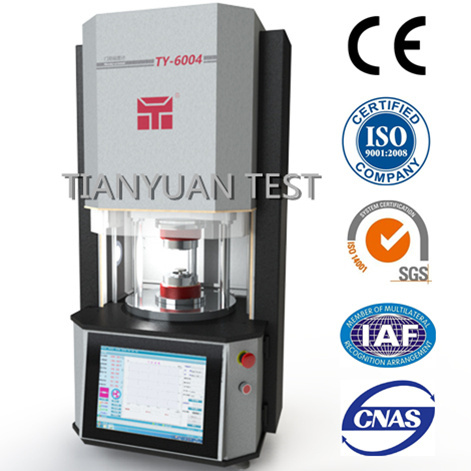 We are China Origin Factory of Mooney Viscosity Tester. If you have any question, please feel free to contact us.